Vladimir Borodin was born in Russia city of Odessa. He started his martial arts carrier at age 7, at age 15 became Junior National Champion in boxing. At age 18 became Soviet Army Champion in karate. In 1980 became 11th USSR National Champion in karate. From 1984 to 1991 trained in kickboxing and Muaythai. 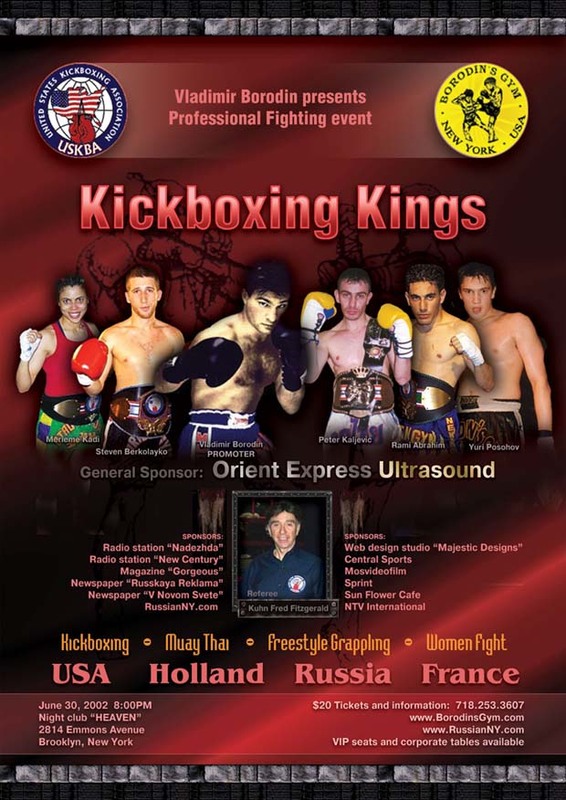 Vladimir Borodin trained in Amsterdam, Netherlands, London, England and Bangkok, Changmai, Uttradit, Thailand under supervision of Great Muaythai Masters like Master Pimu, Tom Harinck, Tony Moore. Vladimir is one of the New York's latest instructors for Muaythai fighters. After opening his Gym in Brooklyn, New York he raised many National, International and World Champions in kickboxing and Muaythai divisions. In the year 2000 one of Vladimir's protege Andrei Dudko became USA K-1 Champion and this year 2001 "BIG DIESEL" Jeff Ford of Borodin's Gym became ISKA Super Heavy weight Champion of the World in Moscow, Russia. Vladimir became National US Muaythai team coach in two National Associations. Also, he was appointed as international representative in three European Associations: IMA (International Mixfight Association) - Netherlands, PSA (Professional Sports Association) - Russia, French Thaiboxing Federation - France. Nowadays Vladimir working hard to promote Muaythai and kickboxing in US and worldwide.